"Sara Wolfe: Is this house really haunted? Watson Pritchett: [near hysterics] It's uh, well, bleh... hah... yeah, it's pretty scary. " The McLoughlin House is a haunted house in Oregon, just on the outer rims of Oregon City. The infamous John McLoughlin, a doctor, had the structure built in the year of 1845. Prior to this, this individual was known to have founded the “Oregon City”. This took place in the year of 1842. Not only was he a doctor, but he also served as a mayor. In addition to this, he also made a lot of investments in the town initially. He always welcomed those visiting the town with open arms, and an open home. Unfortunately, in the year of 1857, he passed away and his daughter had to sell the home that he cherished so much. Here, you will learn why this is considered to be the most haunted house in Oregon today. Once the structure was sold, the new owner transformed it into a hotel. The new owner knew how Dr. McLoughlin enjoyed hosting visitors, but had to do it in such a way that the travelers were required to pay, but kept the pay reasonable. Many would visit the town and stay at the hotel in order to honor and remember the late doctor. The hotel had high standards when it came to delivering quality customer care to the travelers that resided at it – even for a short time. Eventually, finances resulted in the decline of the hotel, and the owner of the local mill that specialized in wool purchased the structure. There were several workers who were Chinese that lived in the home. Unfortunately, they eventually were run right out of town. Then, in the year of 1886, there was a prostitution ring that formed in Oregon City. The individuals that ran and operated this organized crime ring purchased the structure and allowed the women who served as prostitutes to reside there. Customers to the prostitutes went to the beautiful structure to receive many of the services that they purchased. Eventually, the crime ring was shut down and seized. An individual purchased the property and transformed it into an apartment complex. Many individuals came and went when it came to residing in the apartments. However, sadly, this business endeavor was abandoned and so was the structure. To date, there have been many paranormal experiences that have been endured in and around the structure. It seems that the hauntings in which people claimed to experience had to do with the moving of the graves that were located near the structure. These were the graves of the favored Dr. McLoughlin and his wife. There came a time in the history of the structure in which these graves had to be relocated due to renovations of the structure. When this happened, it seemed to spark the interest of the spirits. While the spirits of the doctor and his wife do not seem to be frightening, they have startled quite a few people throughout history. 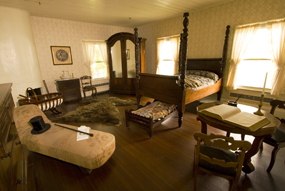 Several individuals have claimed that the good doctor and his wife appear to be cleaning and maintaining their cherished home. There are reports of rocking chairs moving by themselves for long periods of time, heavy footsteps walking along in the structures, music playing, tall shadows moving along in various locations, and more! In addition to this, what appears to be the doctor’s wife, who was named “Marguerite” has been seen staring out of a second floor window, and even pipe tobacco scents have lurked in the air. You see, the wife of Dr. McLoughlin smoked from a pipe – a strange and unusual event of her time, yet something that identifies her presence in the afterlife. There are also reports of spirits that seem to be related to the prostitute ring, and even those of vagrants. If you are seeking adventure and are interested in ghost hunting, this haunted house is sure to be a pure delight! 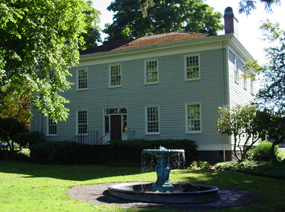 Make arrangements for your tour of the haunted house in Oregon City today, the McLoughlin House!